at the fifth-annual High School Elite PEP Fall Classic. Wisconsin-bound Phillip Perry of the Chi-Town Mixers said it best, summing up the fifth annual High School Elite PEP Fall Classic at Riverside Brookfield on Sept. 4-5. 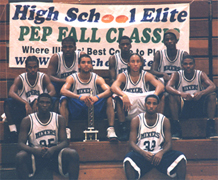 "There were big upsets early and people weren't playing to the best of their capabilities," said Perry, who helped his Mixers to a NIT Championship title. "Guys were thinking they could just go out there and win because of who they were." 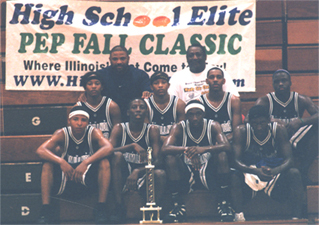 Possibly then that is why in a tournament full of over-hyped superstars, it was a team, the Illinois Hawks, without a starter over 6'2" and no house-hold-names to speak of that ended up winning the whole thing, with a victory over the Chicago Demons White. Led by Chris Head, former coach of Westinghouse and Proviso West, the Hawks, a Westinghouse-based team, were sparked by a tri of former Proviso West players who transferred to Westinghouse this year. Joe Ballard, Kris Harris and Marquis Johnson made the move from the western suburb of Hillside to the west side of Chicago, to attend 'The House' this season. Ballard, a 6'1" combo guard, was the surprise of the tournament with his accurate outside shooting, aggressive play and all-around scoring. "Everybody's out here with superstars and we just got average people doing our thing, playing together, playing defense," said Ballard, who attended St. Joseph as a freshman before he stayed at Proviso West for the past two seasons. "I'm underrated, but everyone will realize it." A four-year varsity player, Ballard is ready to make the move to the mean streets of Westinghouse. His father, a pastor, works at a church near Westinghouse and he said he grew up being in the vicinity most of his life. "It won't be too much of a change for me because I grew up around there," he said. "There's more gang activity and all that, but you've got to look past that and go on and do your business." The only visible ingredient missing from Westinghouse this season is size. Add in 6'7", 260-pound DeAndre Thomas, who played with the Illinois Fire over the weekend, and not many appear to be on Westinghouse's level. "We've got a lot of talent and a good team," Harris said. "If we play together there is nobody who could beat us." With the addition of the transfers, Westinghouse looks to be a serious pre-season contender to win the Class AA state title, as they did in 2002 under the guidance of Head. Head, who continues to referee in his spare time, said he would like to get back into coaching within the year. 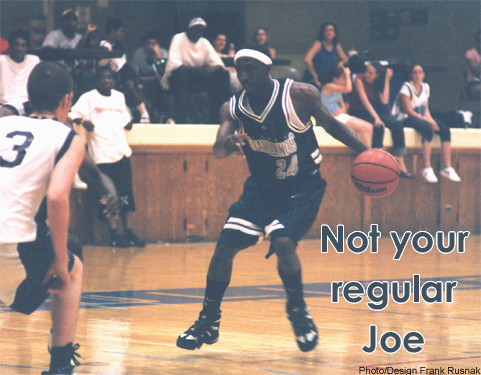 He noted, however, that coaching AAU/summer basketball is what he got his start in and his true love. Illinois Hawks, NCAA first-place finishers. Angel Santiago's last-second three-pointer to send his Chi-Town Mixers to overtime against Game-Time I in the first round of the NIT playoffs. Santiago's buzzer-beating shot to give the Mixers the NIT Championship victory over the Illinois Warriors. The Warriors' sophomore swingman Parrish West who dominated all comers in the NIT Championship game. After repeated calls of, 'He's only going to his left. That's all he's got.' West then proceeded to take his man to the hoop from the right. West is unlikely to compete with Morgan Park until at least the second semester as he works on academic shortcomings in the meantime. 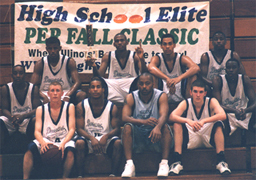 The Illinois Hawks' opening-round victory of the more-hyped Illinois Fire. In that matchup, the Hawks went against their high school counterpart DeAndre Thomas. The star-studded Fire were not able to match the superior pressure and guard play of the Hawks in the end. The best matchup in pool play was Saturday night when possibly the two best 16-under teams in the state went head to head in Ferrari and the Illinois Wolves. Ferrari, who added Crane's Sherron Collins and Harlan's Andre Gullens, did not have enough in the end. Julian's Brandon Ewing teamed with Peoria-based Game Time to show off his increasingly impressive lead-guard abilities. Ewing was teamed with such notables as Peoria Richwoods' Jamar Smith, Peoria Manual's DeMar McKnight and Metamora's Blake Mishler.